« Amex launches blockchain-based business payments using Ripple: Prelude to the Beast and 666? Dr. Thiel continues the series of answering questions that were commonly posed to the old Worldwide Church of God. Using a binder that many speakers were given by that church that contained standardized letters that were sent to answer questions, Dr. Thiel answers them. Normally, in much greater detail than the normally single or double page answers that were given in the past by the old Radio and Worldwide Church of God. 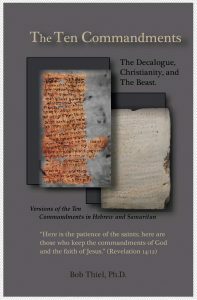 Subjects covered include the 144,000 of Revelation 7 & 14, what the koine Greek shows regarding Jesus being executed on a cross or a pole, the original vs. changed numbering of the Ten Commandments, biblical teachings on the use of musical instruments, whether those resurrected in Matthew 27:52-53 were physical or immortal, whether or not Jesus was a Jew, Jesus being the Son of Man, and Jesus’ genealogies as shown in Matthew 1 and Luke 3. Aspects of church history were also discussed. This entry was posted on Friday, November 17th, 2017 at 12:01 am	and is filed under COG News, Doctrine, Prophecy. Sermon: Were the Ten Commandments ‘Nailed to the Cross’?